The past ten years have seen a dramatic leap in major discoveries in the outer Solar System thanks to the Galileo orbiter at Jupiter and the Cassini orbiter at Saturn. During the next two decades, scientists are eager to return to the outer Solar System with sophisticated equipment capable of unraveling the perplexing questions that continue to remain and that prior missions have created. The spacecraft involved fall under the Flagship class as each one would cost more than one billion dollars with no more than two being launched per decade. The highest priority targets proposed include Europa, Titan, and Neptune, which include its moon Triton. The highest priority of these three proposals is a mission to Europa called the Europa Geophysical Explorer (EGE). 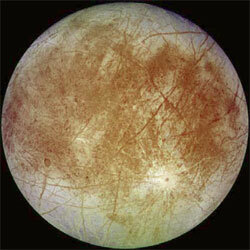 Europa is one of the largest moons of Jupiter and is unusually smooth with the highest hills barely 300 feet high. Vast cracks cover the surface and it is suspected that a global ocean of liquid water lies beneath the icy crust. EGE would cost about $1 billion, but would be capable of determining the ocean’s presence. It would first enter orbit around Jupiter and remain in orbit for at least 18 months. The time is crucial as it will allow the probe to line up for a transfer into a low polar orbit around Europa. It is expected to orbit Europa for at least one month passing as low as 60 miles from the surface. The biggest challenge for EGE will be the intense radiation around Jupiter, therefore it will carry over 400 pounds of shielding so that the radiation will not damage the sensitive electronics. EGE would be able to measure the tidal flexing of the icy crust to establish the ocean’s presence. It will provide detailed surface images and probe the upper few miles of the crust with a radar sounder to look for fissures possibly oozing liquid water, and also for pockets filled with liquid water. The radar probably cannot penetrate deep enough through the ice to reach the ocean, but it can detect areas where warmer ice has transported substances upward from the underlying ocean. There are also plans for EGE to carry a small lander which would help identify sites for future landers and even rovers that could search for chemical and microscopic remnants of life dredged up from the ocean below. If funding is approved, the mission could launch by 2015, but at the moment the budget remains tight and the mission remains on hold. Once the Europa Geophysical Explorer is successfully launched, scientists are planning a return to Titan, the smoggy moon of Saturn. The stunning discoveries made by the Cassini orbiter and the historic landing of Huygens on Titan have revealed it to be like a frigid version of Earth with icy mountains, meandering river beds and deltas, dried up lake beds, sand dunes, and craters. The biggest discoveries of all include vast clusters of lakes filled with liquid methane in the north polar region, possible volcanic activity, and a huge cloud over the north polar region where methane may rain down onto the surface filling the rivers and lakes. The volcanoes are actually cryovolcanoes where water and oxygen may spew out onto the frigid surface from the warm interior and freeze instantly in the -290ºF cold. The Sun’s ultraviolet light and Saturn’s radiation create organic compounds in Titan’s atmosphere, which gives it a smoggy, orange appearance. These compounds rain down onto the surface and can react with the oxygen from the cryovolcanoes to create complex oxygen-containing organic compounds similar to what was found in early Earth. Titan may prove to be a giant laboratory that can help scientists understand how life came about on Earth. Much more needs to be learned about Titan before a lander or rover can be launched, but thanks to an atmosphere 60% thicker than Earth’s, exploring Titan by blimp or balloon is possible. A proposed mission called the Titan Organics Explorer (TOE) would use a hydrogen filled blimp that would cruise through Titan’s smog around 2500-5000 feet above the surface. It would be capable of covering vast distances and also hover over an interesting area for weeks. Then it would descend to within 150 feet of the surface and drop a sampling device that could collect surface material and then reel it in for analysis while cruising to a new target. TOE would be a multi-billion dollar mission; therefore a more budget-minded mission is also under consideration, which would use an unmotorized hot-air balloon, thus keeping the cost closer to $1 billion. A heater would warm Titan’s air to inflate the balloon and would coast in the easterly breeze. Onboard controllers could vent the balloon so it could drop closer to the surface to gather samples the same way as the blimp would. If the mission could be launched around 2020, TOE would be able to cruise above the vast northern lake regions as it would be summer and in continuous sunlight for years. Regardless of which version flies; blimp or balloon, scientists need to fully understand Titan’s weather and clouds as it would be a disaster to fly into a thunderstorm or even a strongly convective cumulus cloud. Voyager 2 revealed Neptune and Triton to be dynamic worlds back in 1989. Neptune has winds exceeding 1000 miles per hour, the fastest in the Solar System. These winds, combined with upwelling storms and sinking air, create shear and result in dark belts and brighter bands along with dark spots and bright clouds. A small amount of methane in the atmosphere, roughly 3%, is just enough to give Neptune a beautiful bluish color. 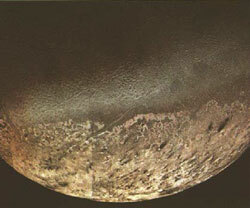 Triton is the largest moon and is peppered with nitrogen-powered geysers that spew plumes up to five miles high before upper-level winds shear them and carry them over 100 miles downwind. A vast ice-cap of methane ice covers the south pole and is tinted pink from the damaging effects of the Sun’s ultraviolet radiation. Triton is so interesting that a Neptune Orbiter Mission is priority over a return to Uranus, even though Uranus is nearly a billion miles closer to Earth. The orbiter would carry two probes that would launch from the main spacecraft before it arrived and would descend deep into Neptune’s atmosphere at different locations. Once the spacecraft is safely in orbit around Neptune, it would study the planet and Triton for at least three years. The orbiter would fly past Triton at least 40 times making close studies of the geysers, ice cap, the unusually smooth surface and take razor sharp images. An alternate version of the mission would include a small Triton lander that would be deployed after the main spacecraft is safely in orbit around Neptune and after an interesting landing site is determined from several of the close flybys of Triton. The problem in putting a spacecraft in orbit around Neptune and Uranus is getting the spacecraft there in a reasonable time of 10 to 15 years. This requires a gravity assist from Jupiter, which would give the spacecraft so much speed that it would require an uneconomically huge amount of fuel to slow it down once it arrived at Uranus and Neptune. Both worlds are smaller than Jupiter and Saturn, therefore the gravitational pull is less, which makes it more difficult for a spacecraft to be captured into orbit without the expense of a lot of fuel. An untried method with the giant outer planets is aerocapture where a spacecraft uses precision guidance to skim off the planet’s outer atmosphere to slow it down enough to be captured into orbit. The technique has worked for Venus and Mars, but the higher arrival speeds and vast distances for Uranus and Neptune will be a challenge unless a form of alternate propulsion is developed. Any orbiter mission to Neptune, and eventually Uranus, would fall under the Flagship class for it would cost several billions of dollars. If steady funding and research are done, the Neptune Orbiter Mission could launch around 2025 and arrive at Neptune around 11 years later with gravity assist from Jupiter. By taking the knowledge of what is known and determining the goals needed to explore the unknown, Flagship missions to the outer planets are possible with proper planning even when facing the reality of strict budgets. The possibility of discovery is as endless as our dreams when it comes to exploring the outer planets and their unique moons, which may hold the key to understanding how the Solar System and life came to be.